Posted on March 31, 2016 by Dayna B. Before returning to Delhi, the last stop on our Golden Triangle road trip was the Agra Bear Rescue Facility. I had learned about this rescue organization and immediately knew I had to fit this into our itinerary. The Agra Bear Rescue Facility, managed by Wildlife SOS, is home to sloth bears that were rescued from captivity by the Kalandar tribe of India. For generations, the Kalandar people have been “training” (read: torturing) these bears to dance and then exploiting the “dancing bears” for money. Unfortunately, India has a very long history of animal exploitation, and this is by far the worst example that I am aware of. The Kalandar people would cover the holes on their muzzles so the tourists wouldn’t see the wounds that were often infected and gruesome. I still don’t understand why tourists would have paid money to see these bears “dance.” Everything about this scenario screams animal cruelty. I guess ignorance is bliss? Public Service Announcement: People of the world…please educate yourselves so you don’t perpetuate this type of exploitation and cruelty! The good news is that it is now illegal to hold these wild animals captive. The bad news is that the captured bears wouldn’t be able to survive in the wild. Wildlife SOS stepped in to care for and rehabilitate these adorable bears. Most of the bears seemed very comfortable and happy at the rescue facility, while others still displayed periodic signs of post-traumatic stress. The cuteness factor is almost too much to handle as you watch these bears play with their toys and enrichment activities, but the horrific scars on their muzzles is a constant reminder of what they had been through. Many of the bears have life-long illnesses or injuries resulting from their captors. For instance, several of the bears are now blind because the optic nerve was damaged during the piercing of the muzzle. In addition to rehabilitating the bears, Wildlife SOS sought out to rehabilitate the Kalandar people. Having relied on the sloth bears as their main source of income for generations, they didn’t have any employable skills. So they were taught a skill or trade so they could ethically earn a living. The rescue facility has a gift shop of craft items handmade by the Kalandar people and 100% of the proceeds are returned to them. 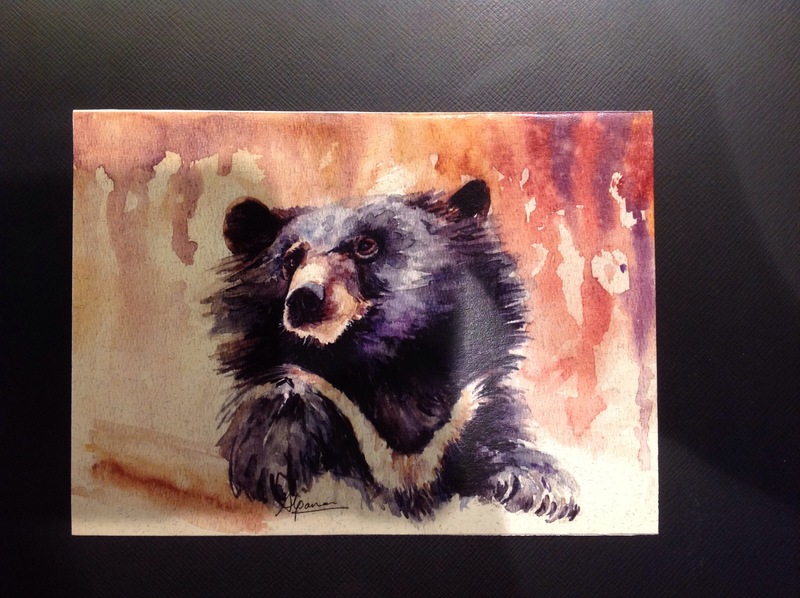 I purchased assorted watercolor note cards and a scarf hand-dyed with the unmistakable silhouettes of sloth bears. I was allowed to take pictures at the rescue facility, but I was asked that they remain for “personal use only” and not be shared on social media. Therefore, the pictures in this post came from Wildlife SOS or their affiliated partners. Wildlife SOS is also making extraordinary strides for the treatment of elephants in India. I really wish we had time to visit their nearby elephant conservation center. You can follow them on Facebook and Instagram to learn more about the amazing work they do, all while getting daily doses of cuteness.